Detroit — A photograph snapped by a citizen and distributed to the media led to the arrest of two police officers who allegedly robbed and assaulted two citizens last week, Detroit Police Chief James Craig said Monday. The alleged robbery happened around 4:45 p.m. at a Citgo gas station on French Road. They drove to the station together in a private vehicle, approached the victims with their guns drawn and badges hanging from their necks, Craig said. “It’s alleged they stole money and a cellphone,” Craig said. Stair added that one of the victims was struck with one of the officers’ guns, although his injuries are not thought to be life-threatening. “The Good Samaritan who took those photographs saw that something wasn’t right,” Craig said. Both victims are in their early 20s. Craig pointed out that, because the two officers are not suspected in the other reported robbery involving fake cops, there are others who are impersonating police officers and robbing citizens. 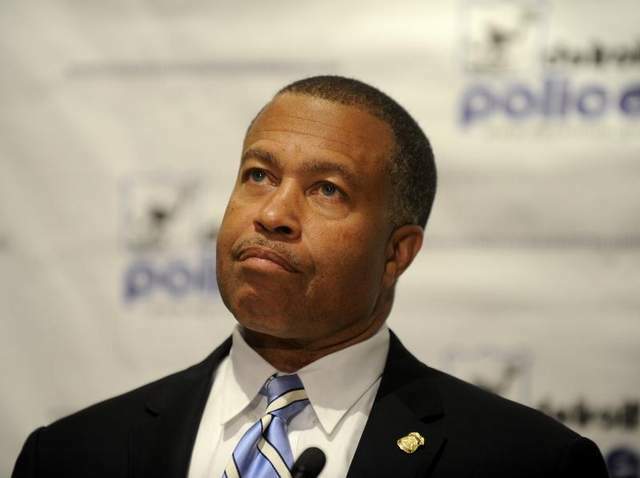 “We should be diligent in making sure when we’re stopped, it’s by police officers,” Craig said. A spokeswoman for the St. Clair Shores Police Department said the department is aware of the ongoing investigation but provided no further information.